Kansas is one of the states I always wanted to visit. Maybe it’s not a place full of well-known world-class attractions but its name and image evokes classic pictures of America. The idea of going there was chasing me for the last few years, so planning my US trip for 2011 I decided to include it in my itinerary. My tour of the southern plains started in Kansas City (KC) which, confusingly, is located in Missouri. Well, to make things even more complicated there are actually two Kansas Cities neighbouring each other, one in Missouri and one in Kansas. The one in Missouri is the proper city, with the classic American downtown, while the KC in Kansas is rather just a suburb. KC was traditionally seen as the gateway to the west. Cattle driven from Texas and other places by cowboys were slaughtered here or loaded into trains heading east, and migrants going west changed from trains to horse wagons. Two main attractions of Kansas City are located next to each other, just south of downtown. The Union Station, a classic American train station representing the golden age of railways was one of the most important and busiest stations in the USA, and the Beaux-Arts building was the second-largest station in the nation when it opened in 1914. Nowadays it is nicely renovated and home to a family-friendly science museum (including 3D cinema and planetarium), Irish Museum, shops, restaurants and café. What is the most impressive is the size and architecture of the building itself. It indicates how busy a station had to be during its heyday. Ironically, it is now serving only four trains and around 400 passengers a day. Right next to the station is the Liberty Memorial. Opened in 1926, it is a monument commemorating soldiers fallen during World War I. Built in Egyptian Revival style, it is an impressive structure indeed, topped by tall tower. Surrounded by a nice park and located on a hill overlooking downtown KC, the monument grounds are a great place for a stroll or a picnic. From KC I drove west, entering the real Kansas. First stop, Lawrence, which is a small town, home of University of Kansas, and located about 60km from KC. It offers a relaxed atmosphere, some good food, coffee and shopping. Among the shops is Kansas Sampler, offering all things Kansas, like clothing (especially connected to various Kansas sport teams), magnets, cards, food etc; a great place to fill your suitcase with gifts. Another shop, which seriously puzzled me, was called “Brits”. Selling all sorts of British goods, it wouldn’t be out of place in touristy part of London. But in the middle of Kansas? Weird. Next stop Topeka, capital of Kansas. Apart from the state capitol, it is not a particularly interesting place. Of course I did visit the Kansas State Capitol, but unfortunately it was undergoing reconstruction work, so tours were severely limited. It is a classic capitol building, two wings dominated by a massive dome, and it’s one of the tallest among all the capitols. West of Topeka, settlements become smaller and distances between them get longer. This is Kansas how I have always imagined it. And I was absolutely loving it. After leaving the major freeway (I-70 to be precise) at Manhattan (yes there is a Manhattan in Kansas), I took Kansas Hwy 177 south. Called Flint Hills Scenic Byway, it is a really great drive. The road is winding between and on top of the gently rolling hills covered with natural pastures. Due to cherty soil, the land is better suited to ranching than farming. Because of this, the Flint Hills is still largely native prairie grassland, one of the last great preserves of tall-grass prairie in the country. Lack of trees allows for some amazing uninterrupted vistas which for me are an important part of the American experience. Tallgrass Prairie National Preserve near the Strong City shouldn’t be missed. Offering self-guided walking trails, which let you get close to this amazing environment, as well as historic 1881 ranch, it is run by the National park Service and a charity called Nature Conservancy. From there, a scenic stretch of Hwy 177 continues to the outskirts of Wichita, which being the largest city in Kansas was convenient place for an overnight stop. Old Cowtown Museum in Wichita was probably the best unexpected attraction during my trip. I would have missed it if I didn’t stop overnight in Wichita as I found a leaflet about it in the motel I was staying in. Initially I thought it was simply a collection of old buildings but it is actually much more than that. It is a living history museum with actors in period clothes creating an authentic Old West atmosphere. It is absolutely brilliant. There is a saloon where you can buy the old-taste lemonade, blacksmith shop where you can watch a blacksmith at work, newspaper office with presentations of old printing methods, plus many other buildings like the sheriff’s office, dry goods store, train station, hotel, drugstore or bank, which you can enter and explore yourself. You can also join the horse wagon rides and watch occasional shoot-out on the main street. Most of the buildings are authentic and brought to the museum to save them from destruction at their original locations. I was there for a few hours, which passed surprisingly fast while I had a lot of fun. After few minutes in the museum it is really possible to forget we have 21st century already. For anyone anywhere close to Wichita this place is a must-see destination. Leaving Wichita I turned west again. Density of population went down quite dramatically and I could feel I was entering what was once called the Wild West. 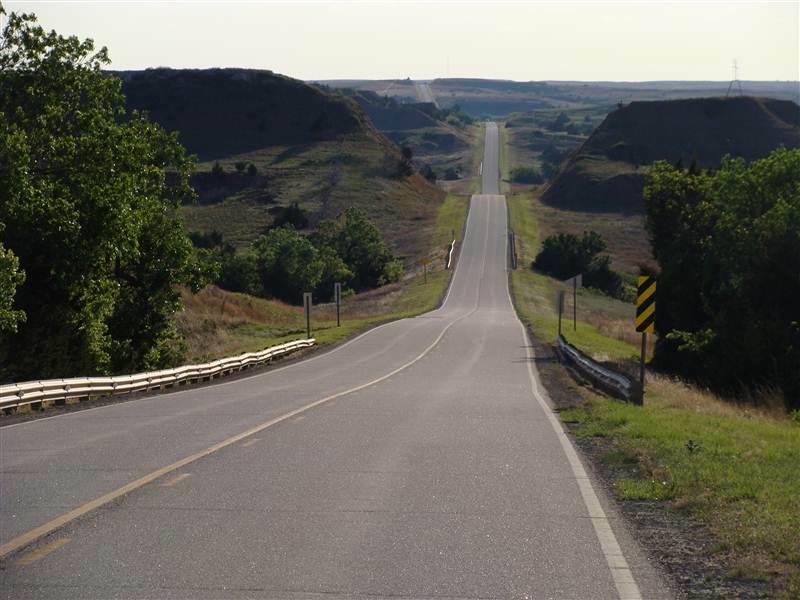 I chose US Hwy 160 which in this part of Kansas is called Gypsum Hills Scenic Byway. It was another great drive but landscape was quite different from that of the Flint Hills. Hills here were less round but rather more dramatic buttes with steep colourful slopes and flat tops. Ranching dominates here as well but vegetation was drier than that in the Flint Hills. The road was straight but going up and down, without end. 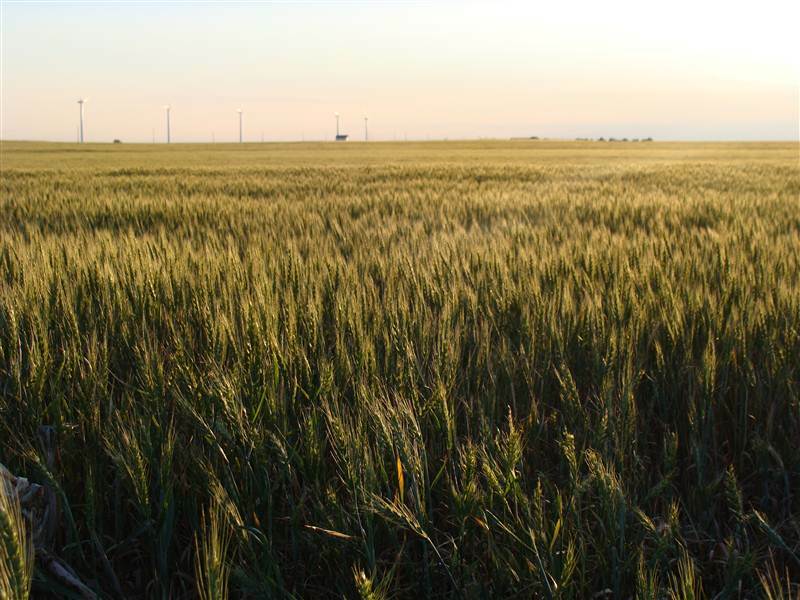 Moving further west and north, going towards the famous Dodge City, I entered the classic wheat-growing regions of Kansas. With roads stretching indefinitely towards the distant horizon and endless fields on the both sides of the highway you could feel like crossing some sort of wheat ocean. Only the telegraph poles and some distant wind farms provided vertical attractions in this mostly horizontal landscape. With the sun setting and country music playing, there is no better way of travelling. Forget luxury cruises or flying first class, forget nice restaurants or posh hotels. Cheap motels full of truck drivers and fast food joints, where a small size drink comes in a one gallon cup, is the way to go in these parts of the country. Dodge City, with a population of 27,000 souls, feels like a real metropolis in this empty bit of the great plains. It was once the wildest of the frontier towns with characters like Wyatt Earp, James Earp, Ed Masterson and Doc Holliday serving as law enforcement. Nowadays Dodge is a sleepy western town where pick-up trucks dominate streetscape in the same way as yellow cabs do in the Manhattan. You can explore its colourful past in the Boot Hill Museum, whose name comes from Boot Hill Cemetery where cowboys were once buried with their boots on. It is another living history museum but much smaller than the one in Wichita. The big difference is also the fact that buildings here are reconstructions rather than original ones. Crossing from Kansas to Colorado is surprisingly anti-climatic. Most people thinking of Colorado think of spectacular mountains. In reality the eastern third of the state is effectively an extension of Kansas with a flat landscape dominated by farming and ranching. But there are interesting things to see, too. One of them is Bent’s Old Fort National Historic Site near La Junta. It features a reconstructed 1840’s adobe fur trading post on the mountain branch of the Santa Fe Trail where traders, trappers, travellers, and Plains Indian tribes came together for trade. Kit Carson was employed there as a hunter, and the explorer John C Frémont used it as a staging area. Today, living historians recreate the sights, sounds, and smells of the past with guided tours and demonstrations. It is all really well done and the fort is nicely located on the banks of the Arkansas River. Moving further south, there is the Texas panhandle, one vast expanse of bleak, flat land. Driving the Interstate 40, one can think there is nothing really to see but there are some hidden gems. And I don’t mean the largest cross in the western hemisphere (located in Groom and not really hidden, as you can see it for miles from the freeway), or the Cadillac Ranch in Amarillo. 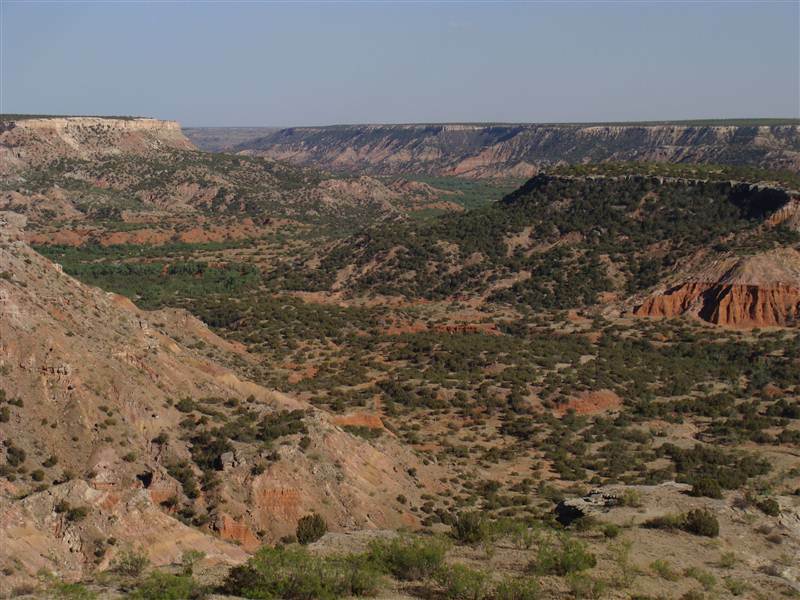 Cadillac Ranch is a quirky and interesting public art installation, and a great photo stop, but the real treasure of the panhandle is the Palo Duro State Park, sometimes called the Great Canyon of Texas. Well, it’s not really the Grand Canyon, but with depths of up to 300m, an average width of 10km and a length of almost 200km, it is an impressive geological feature. The park offers walking, biking and horse-riding trails among colourful rocky outcrops in the form of hoodoos, buttes, steep-walled mesas and other crazy shapes. As Georgia O’Keeffe once wrote, “It is a burning, seething cauldron, filled with dramatic light and colour.” The best time to visit is late afternoon when the temperature is lower and the light is good for photography. If you have only a bit of time, it is still worth stopping by and admiring this amazing landscape from the few viewpoints along the access road. If time allows, it is a great place for camping too. For those interested in route 66 experiences, I recommend a stop in Shamrock, where a renovated art deco gas station, the “U-Drop-Inn Cafe”, serves as tourist information. The next state on my journey was Oklahoma, which is also the 40th state I have visited (yeah, just 10 more to go). I crossed from Texas to Oklahoma in the town of Texola. 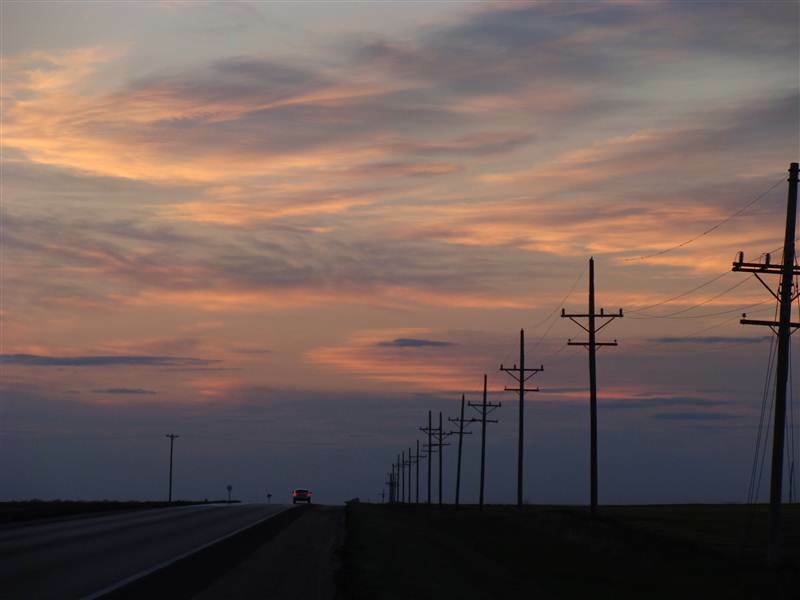 It is located only 28 seconds from the 100th meridian which forms a border between the Texas panhandle and Oklahoma. During the early times its inhabitants lived in both of the states without ever moving, as the town was surveyed eight times. It was also aptly named Texokla and Texoma. To be honest I would never have stopped there if I wasn’t in search of historic Route 66. It is possible to drive some surviving bits of it, just west of town, but it was actually just a disappointing stretch of old two-lane concrete highway. Nothing special. I have to admit I never understood all the fuss about Route 66 but had to check if I was right in my scepticism. I was. There are more scenic roads in America, there are longer roads, and there are more impressive roads. Roads which actually still exist as opposed to Route 66. I blame clever marketing for all this madness. Texola itself was surprisingly interesting. With only 36 inhabitants (according to 2010 census) it is practically a ghost town. Many buildings (including gas station which was once serving Route 66 – for those into these things) are falling apart or are completely overgrown; usually both. A great photo opportunity, but I seriously wonder where these 36 people live. Oklahoma is greener than Texas and less flat. I recommend going off the main freeway and enjoy driving its peaceful state highways. For example Oklahoma Hwy 152 is a great alternative to busy interstate 40. Probably the most unexpected attraction in the state is Wichita Mountains. With a maximum of 750m elevation, they are not true mountains but the granite peaks are still rather unexpected and dominant in the gently rolling state. A big part of the region is protected by the Wichita Mountains Wildlife Refuge which, covered by the remnants of mixed grass prairie, is host to herds of bison and longhorn cattle as well as a colony of super-cute prairie dogs. Kids will love them. One place not to miss is definitely Mount Scott. From its rocky 751m peak you will get probably one of the best views in the Great Plains. Absolutely spectacular, especially just before the sunset. You can drive all the way to the top and the mountain road drive is fun in itself. Bordering the wildlife refuge is Fort Sill. An active military installation, it is also a National Historic Landmark. You can visit it, but you will be asked for ID at the checkpoint. Fort Sill was built by General Sheridan in 1860s during the, so called, Indian Wars and it is one of the best preserved military outposts from that period. Many of the original stone buildings (most of which are still standing) were constructed by the famous 10th Cavalry, a group of black “buffalo soldiers”. Among the scouts stationed in the fort were Buffalo Bill Cody and Wild Bill Hickok. Geronimo was prisoner here and is buried at the fort; his grave is accessible to visitors. In short, Fort Sill has a fascinating history which is impossible to condense here. I finished my Wild West experience in Oklahoma City where, as per tradition, I couldn’t skip the state capitol. It was a strange experience as it was Sunday, and apart from the guard at the gate, I was probably the only person in this vast building. It is actually the last capitol finished in the United States as its dome was only added in 2002. It is also the only capitol with its own active oil well. Oklahoma City become unfortunately well known in 1995 when its federal building was bombed. Today, the well-designed Oklahoma City National Memorial commemorates 168 victims of that event. Located in the downtown, right in the place where the building was standing, it is a nice place to stroll or for a moment of reflection. On the neighbouring building, now hosting a museum, you can still see a damaged fire-escape staircase. To cheer things up during my visit, the whole city was in the heat of NBA playoffs because its team, Oklahoma City Thunder, was doing very well. The Wild West is difficult to really define. Is it a place? Is it period of time? All I can say is that my trip across Kansas, Oklahoma and parts of Texas and Colorado had something which made me feel I’m a bit closer to understanding what the Wild West really is. This entry was posted in Uncategorized and tagged bent's old fort, colorado, dodge city, Flint Hills Scenic Byway, fort sill, great plains, Gypsum Hills Scenic Byway, kansas, kansas city, oklahoma, oklahoma city, old cow town museum, palo duro state park, road trip, Tallgrass Prairie National Preserve, texas, texas panhandle, texola, travel, usa, wichita, wichita mountains, wichita mountains wildlife refuge, wild west on June 8, 2011 by admin.